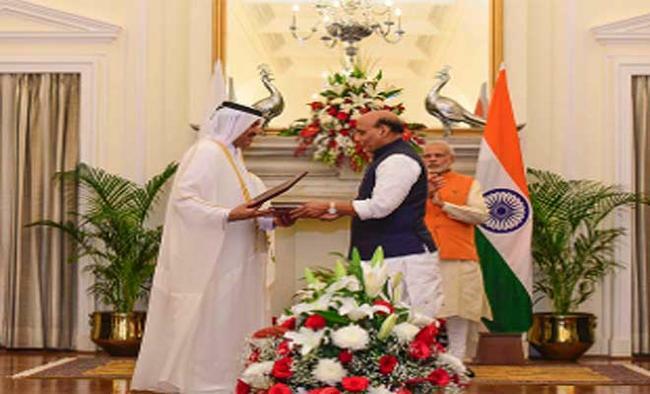 New Delhi: India and Qatar on Saturday signed four agreements on visas, cyberspace and investments following delegation-level talks led by Prime Minister Narendra Modi and his Qatari countepart Sheikh Abdullah bin Nasser bin Khalifa Al Thani. "Four Forward! The leaders witness exchange of four agreements in the fields of visas, cyberspace and investments," External Affairs Ministry spokesperson Vikas Swarup tweeted. One agreement allows holders of diplomatic, special and official passports of the two countries visa-free travel between the two countries. A protocol on technical cooperation in cyber space and combating cyber crime was signed between the Ministry of Home Affairs of India and the Ministry of Interior of Qatar. The protocol adds an important dimension of bilateral technical cooperation in cyberspace and combating cyber crime to the existing framework agreement in the field of security signed in November 2008. A letter of intent was signed that allows for negotiations on an agreement on grant of e-visa to businessmen and tourists of the two countries. A memorandum of understanding (MoU) was also signed between Supreme Committee for Delivery and Legacy of Qatar and Confederation of Indian Industry which will provide a framework for project experts for Indian companies in Qatar, including through participation in infrastructure projects in Qatar undertaken for the 2022 FIFA World Cup. In a separate tweet, Swarup said that another MoU was signed for encouraging greater collaboration and exchange in the field of national ports management. Al Thani arrived here on Friday in what was the third exchange of high-level visits between India and the Gulf nation in less than two years. Qatari Emir Sheikh Tamim bin Hamad Al-Thani visited India in March 2015 which was followed by the visit of Modi to that Gulf nation in June 2016. India enjoys close and friendly relations with Qatar, which are based on mutually beneficial commercial exchanges and extensive people-to-people contacts. Qatar is not only an important trading partner for India in the Gulf region but is also the largest supplier of LNG, accounting for 66 percent of the total imports in 2015-16. Indians form the largest expatriate community in Qatar and their positive contribution in the progress and development of their host country is well recognised. There are over expatriate 630,000 Indians in Qatar.